Staff of INTI International University (INTI IU) marked the installation of 14th Yang Di Pertuan Agong DYMM Tuanku Alhaj Abdul Halim Mu’Adzam Shah by singing the national anthem and reciting the Rukunegara in a flag raising ceremony on campus. A mini exhibition entitled ‘Raja Kita’ was also put up by staff and students to create awareness of the installation. Amit Sevak (2nd from right) and Professor Walter Wong, Vice Chancellor of INTI IU, (4th from right) at the flag raising ceremony. “At INTI, we embrace many values and traditions that define our organization and make us unique. For instance, the tradition of ensuring we provide a meaningful and dynamic education that can transform lives has been in existence for the past 25 years. As we celebrate the installation of the new king in Malaysia, we also take time to celebrate the many values and traditions across INTI,” said Amit Sevak, CEO Laureate Malaysia who was also present at the ceremony. 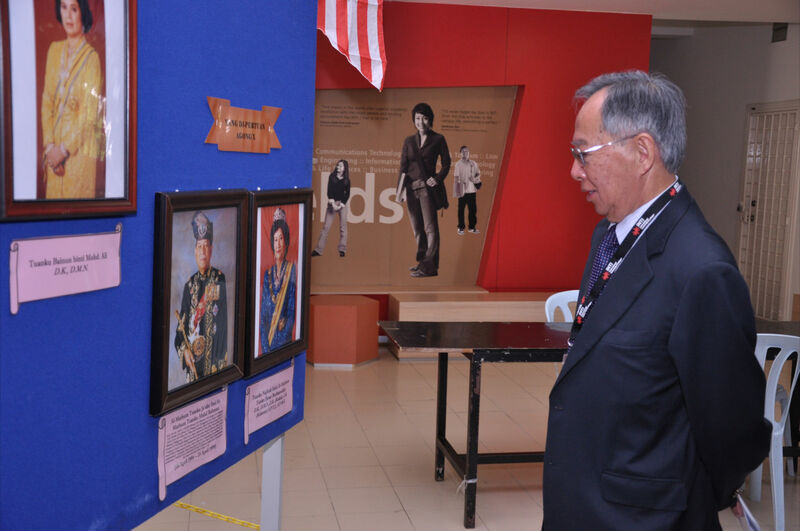 Professor Walter Wong, Vice Chancellor of INTI IU, at the ‘Raja Kita’ exhibition which features the nation’s past and present rulers and consorts.